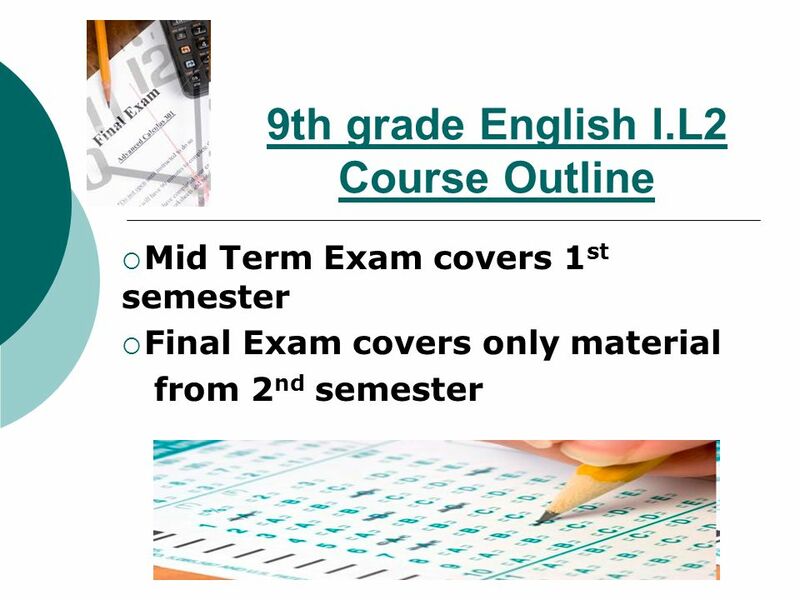 5 English I.L2  But Wait!... 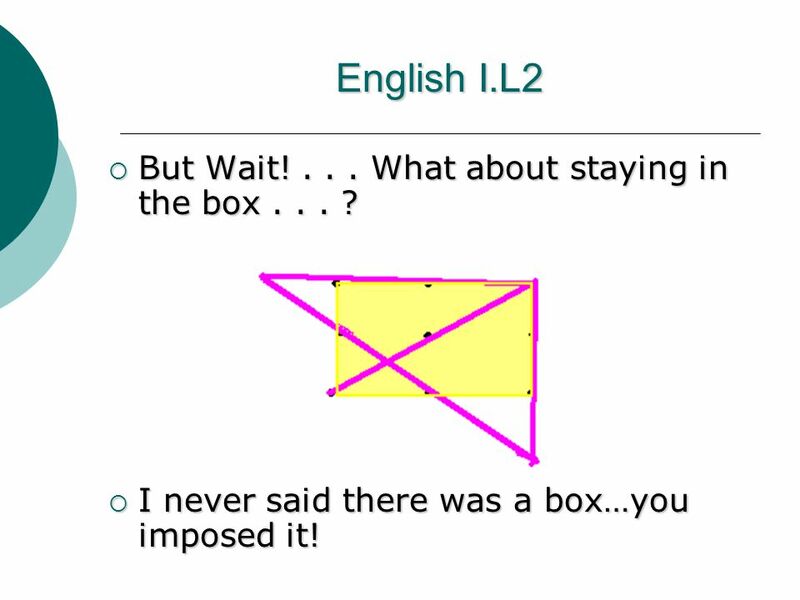 What about staying in the box... ? 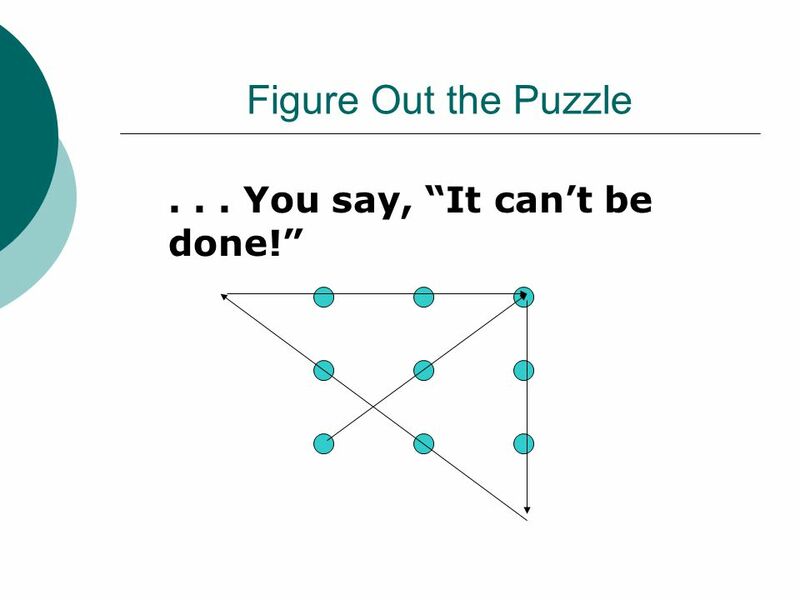  I never said there was a box…you imposed it! 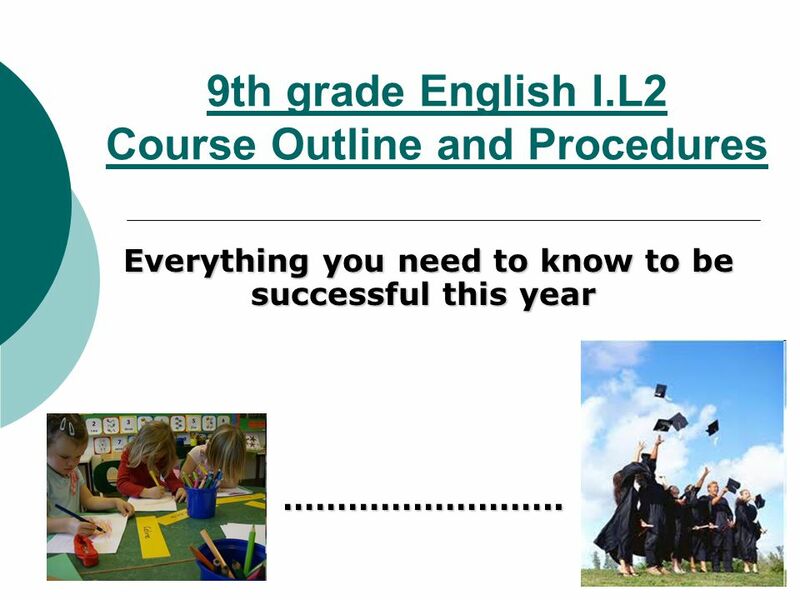 7 9th grade English I.L2 Course Outline and Procedures Everything you need to know to be successful this year Everything you need to know to be successful this year……………………..
9 9th grade English I.L2 PROCEDURES Arrive On Time: Some of the most fascinating and intelligent people I know aren't very prompt. 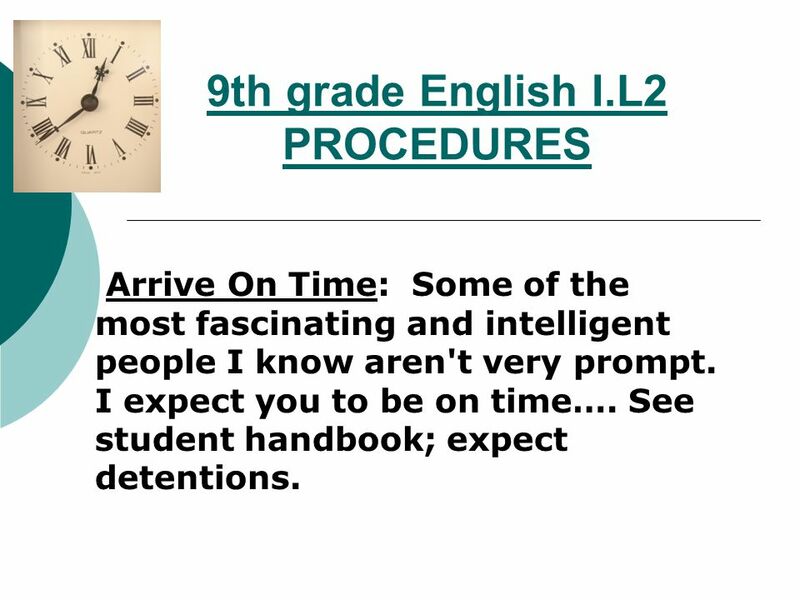 I expect you to be on time…. See student handbook; expect detentions. 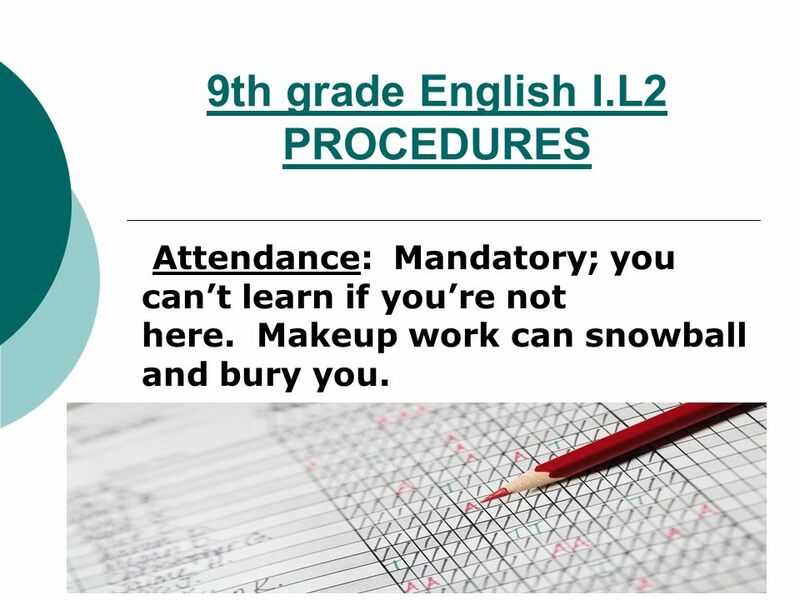 10 9th grade English I.L2 PROCEDURES Attendance: Mandatory; you can’t learn if you’re not here. Makeup work can snowball and bury you. 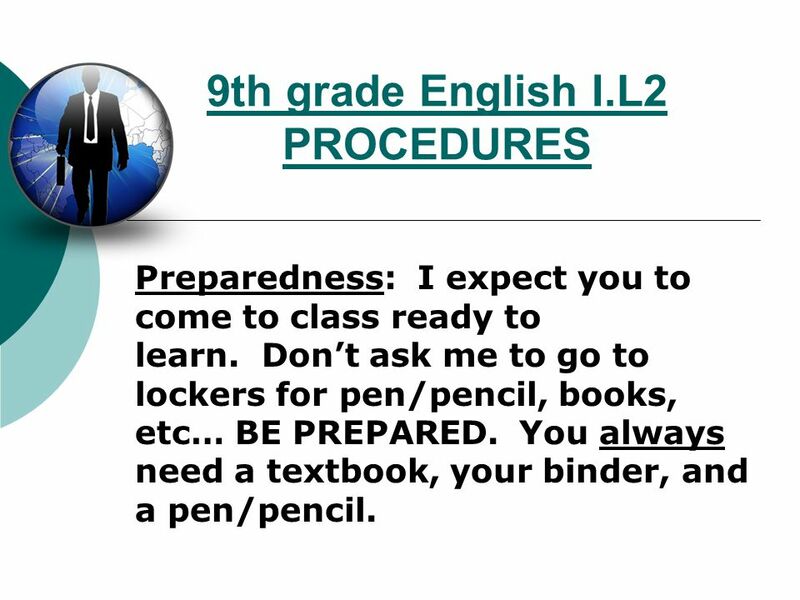 12 9th grade English I.L2 PROCEDURES Preparedness: I expect you to come to class ready to learn. Don’t ask me to go to lockers for pen/pencil, books, etc… BE PREPARED. You always need a textbook, your binder, and a pen/pencil. 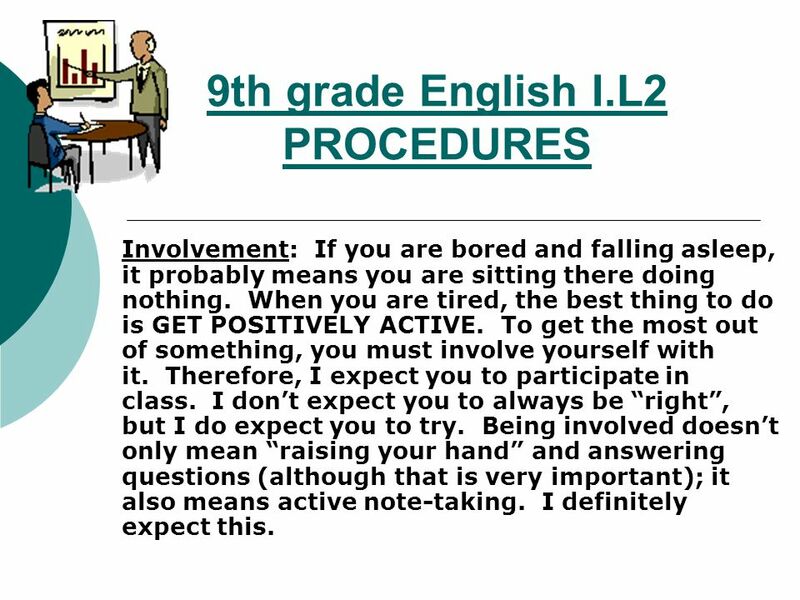 13 9th grade English I.L2 PROCEDURES Involvement: If you are bored and falling asleep, it probably means you are sitting there doing nothing. When you are tired, the best thing to do is GET POSITIVELY ACTIVE. To get the most out of something, you must involve yourself with it. Therefore, I expect you to participate in class. I don’t expect you to always be “right”, but I do expect you to try. 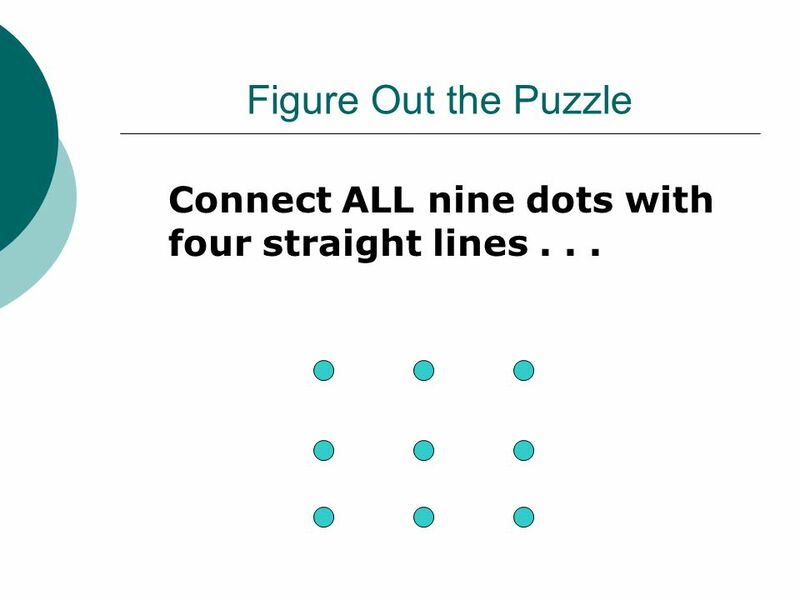 Being involved doesn’t only mean “raising your hand” and answering questions (although that is very important); it also means active note-taking. I definitely expect this. 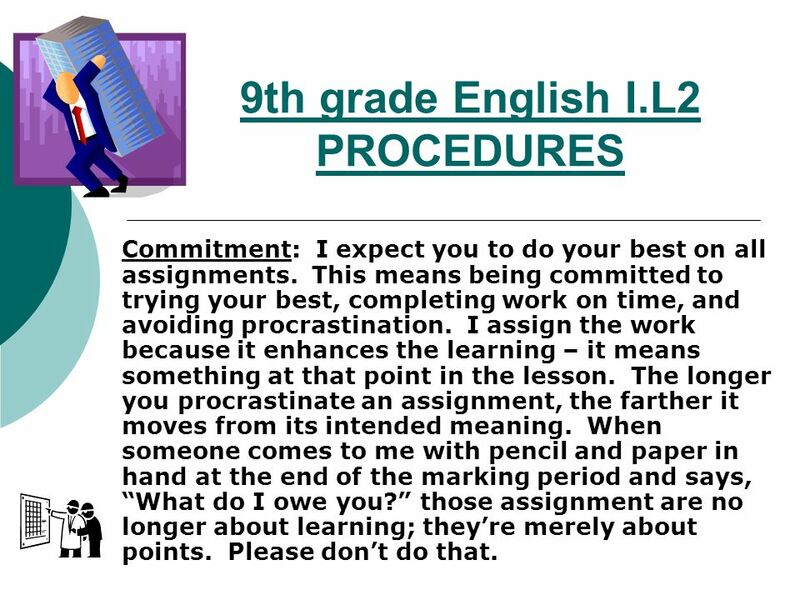 14 9th grade English I.L2 PROCEDURES Commitment: I expect you to do your best on all assignments. This means being committed to trying your best, completing work on time, and avoiding procrastination. I assign the work because it enhances the learning – it means something at that point in the lesson. The longer you procrastinate an assignment, the farther it moves from its intended meaning. When someone comes to me with pencil and paper in hand at the end of the marking period and says, “What do I owe you?” those assignment are no longer about learning; they’re merely about points. Please don’t do that. 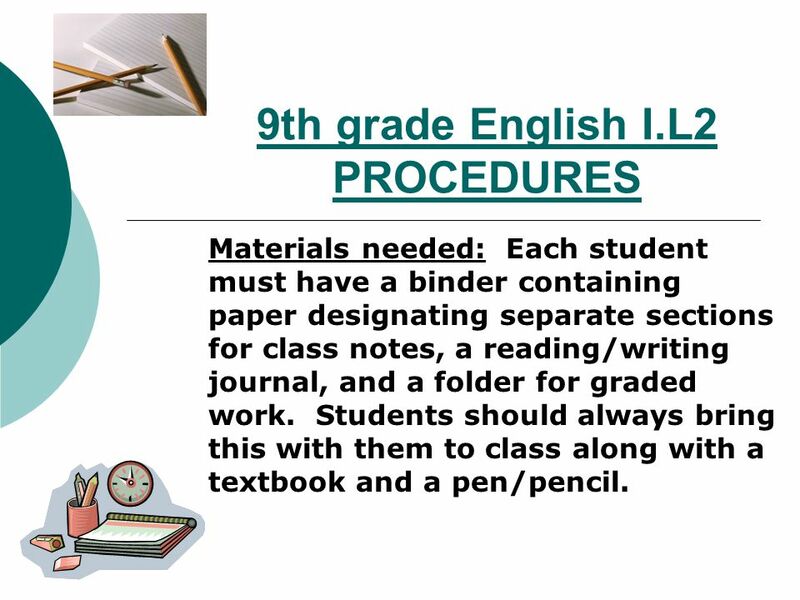 15 9th grade English I.L2 PROCEDURES Materials needed: Each student must have a binder containing paper designating separate sections for class notes, a reading/writing journal, and a folder for graded work. Students should always bring this with them to class along with a textbook and a pen/pencil. 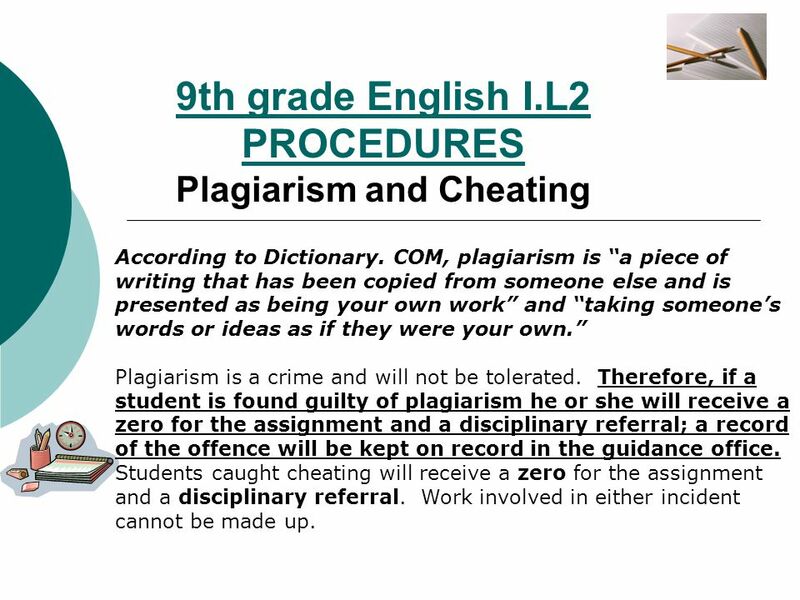 16 9th grade English I.L2 PROCEDURES Plagiarism and Cheating According to Dictionary. COM, plagiarism is “a piece of writing that has been copied from someone else and is presented as being your own work” and “taking someone’s words or ideas as if they were your own.” Plagiarism is a crime and will not be tolerated. Therefore, if a student is found guilty of plagiarism he or she will receive a zero for the assignment and a disciplinary referral; a record of the offence will be kept on record in the guidance office. Students caught cheating will receive a zero for the assignment and a disciplinary referral. Work involved in either incident cannot be made up. 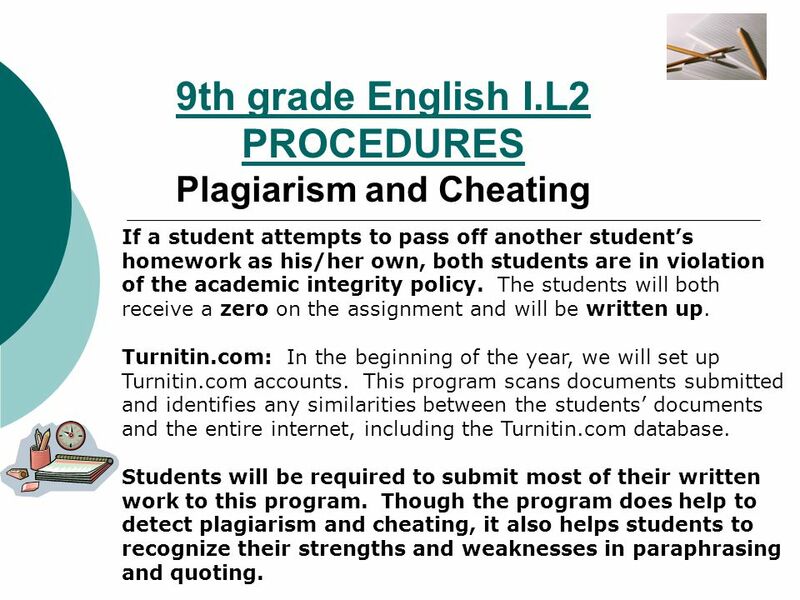 17 9th grade English I.L2 PROCEDURES Plagiarism and Cheating If a student attempts to pass off another student’s homework as his/her own, both students are in violation of the academic integrity policy. The students will both receive a zero on the assignment and will be written up. Turnitin.com: In the beginning of the year, we will set up Turnitin.com accounts. This program scans documents submitted and identifies any similarities between the students’ documents and the entire internet, including the Turnitin.com database. 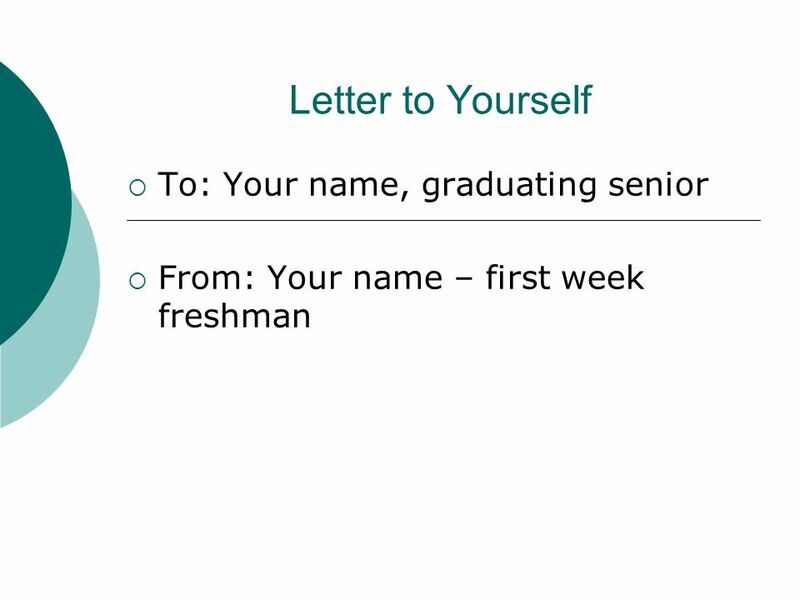 Students will be required to submit most of their written work to this program. 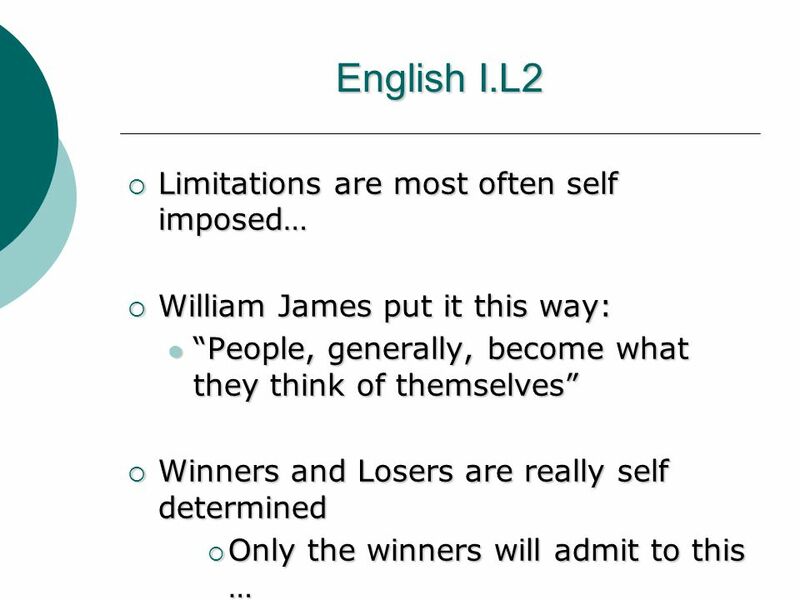 Though the program does help to detect plagiarism and cheating, it also helps students to recognize their strengths and weaknesses in paraphrasing and quoting. 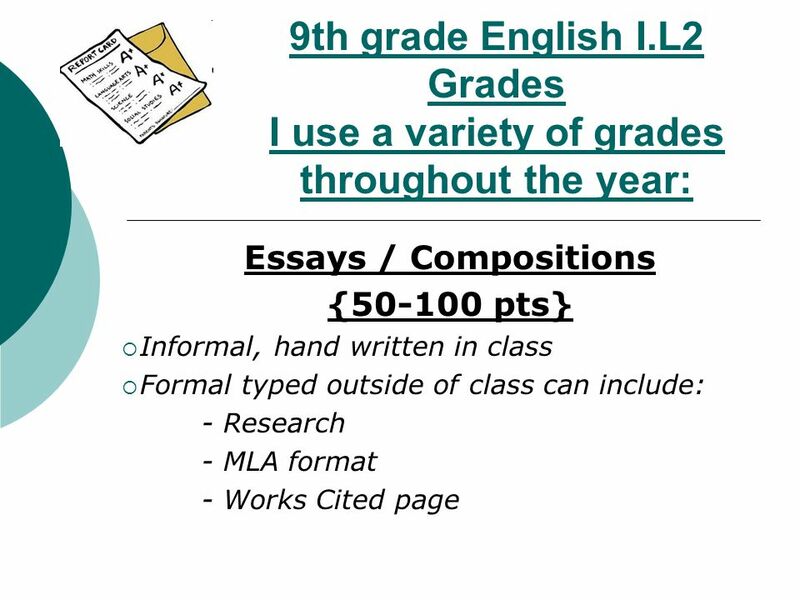 22 9th grade English I.L2 Grades I use a variety of grades throughout the year: Class-work Homework(10-30 pts}  Usually informal, hand written in and out of class assignments.  This will “make or break” some people. 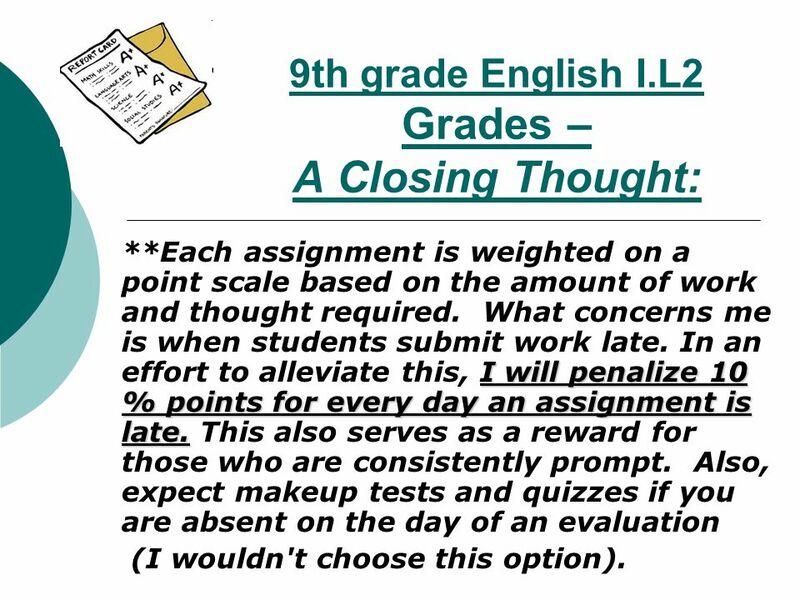 23 9th grade English I.L2 Grades – A Closing Thought: I will penalize 10 % points for every day an assignment is late. 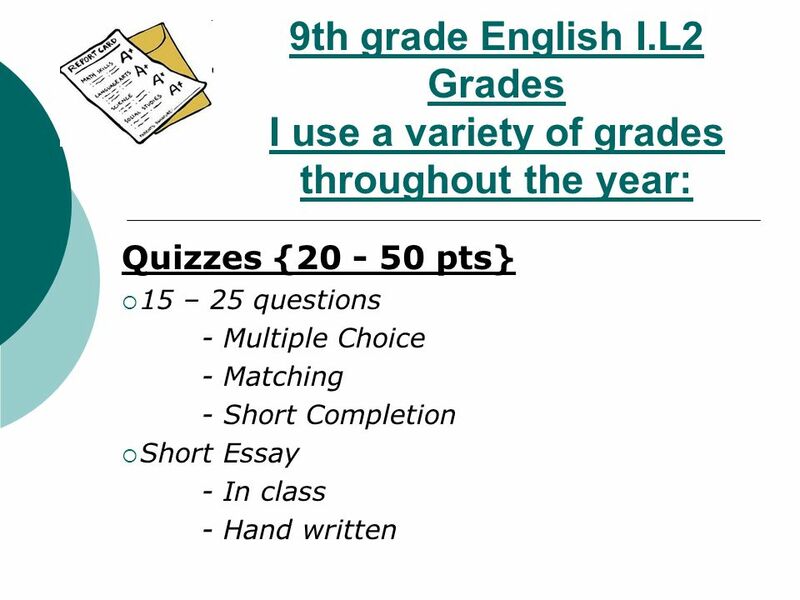 **Each assignment is weighted on a point scale based on the amount of work and thought required. What concerns me is when students submit work late. In an effort to alleviate this, I will penalize 10 % points for every day an assignment is late. This also serves as a reward for those who are consistently prompt. 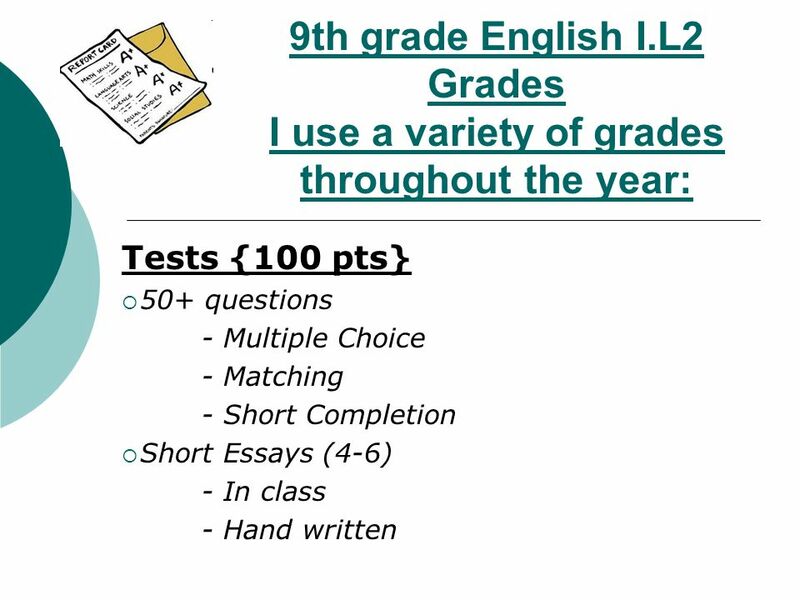 Also, expect makeup tests and quizzes if you are absent on the day of an evaluation (I wouldn't choose this option). 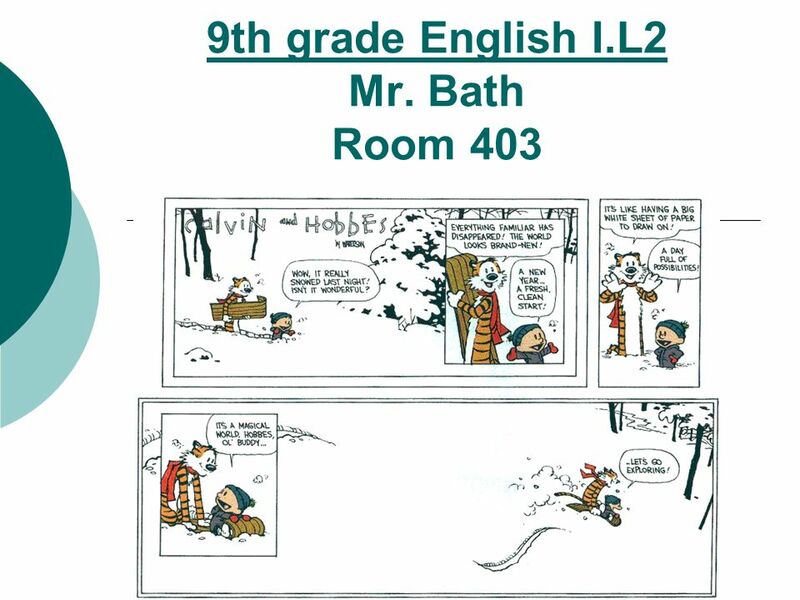 Download ppt "9th grade English I.L2 Mr. Bath Room 403. 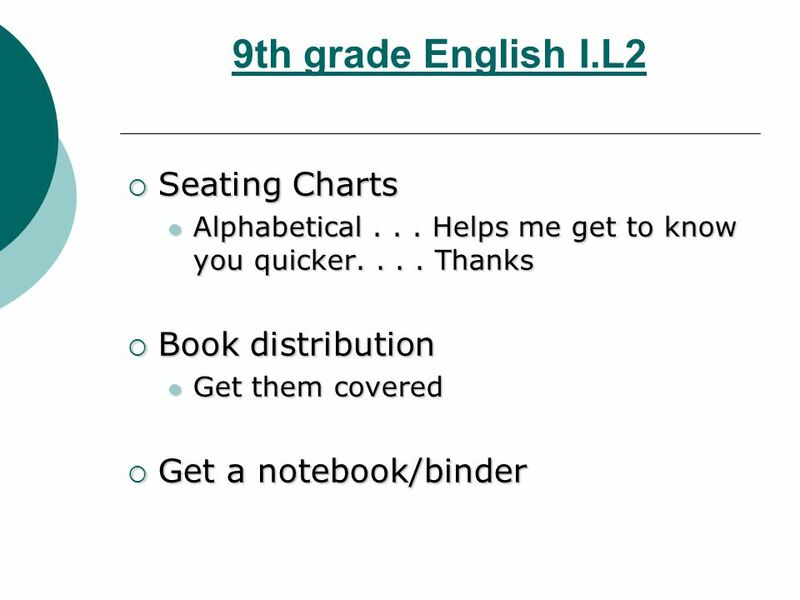 9th grade English I.L2  Seating Charts Alphabetical... Helps me get to know you quicker.... 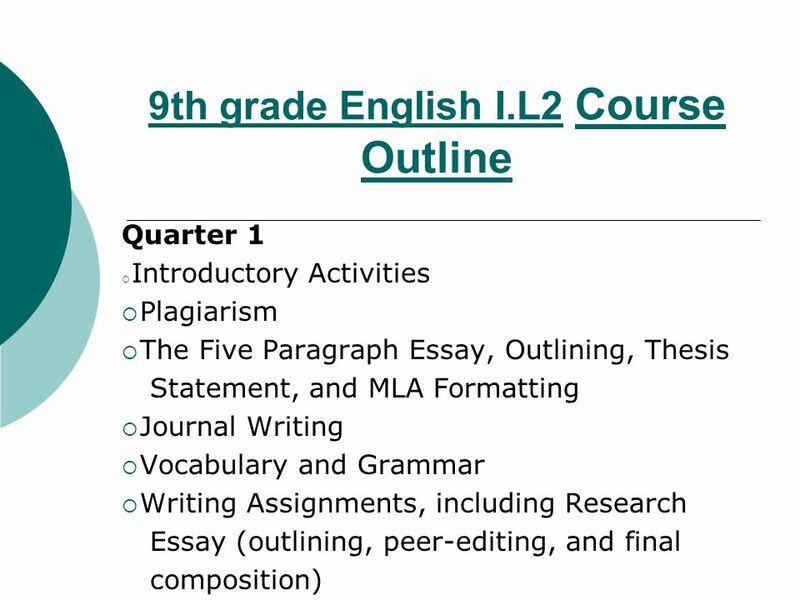 Thanks Alphabetical..."
English IV (College Preparatory) Mrs. Dawn Ligas Havelock High School Room 706. 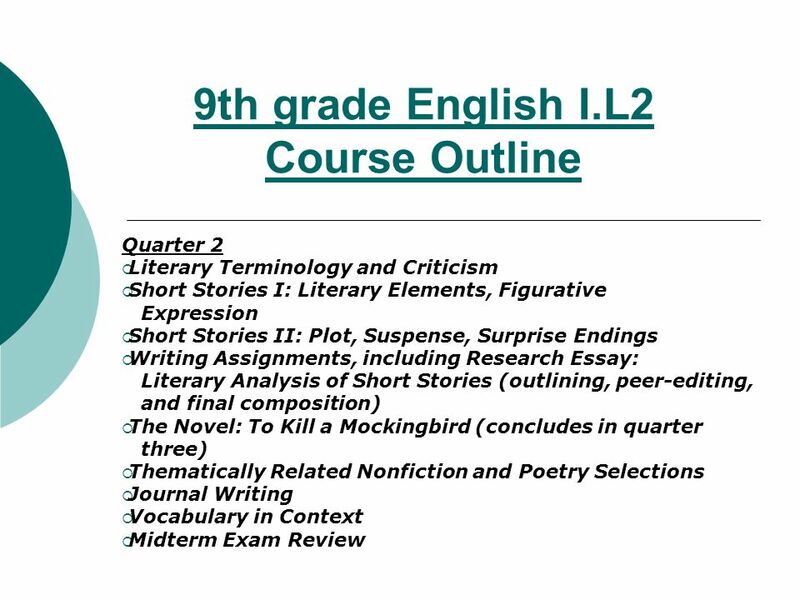 Welcome to English Ms. Lori Trice Ms. Attaway Course Description Reading Reading Independent and group Independent and group Short stories Short stories. 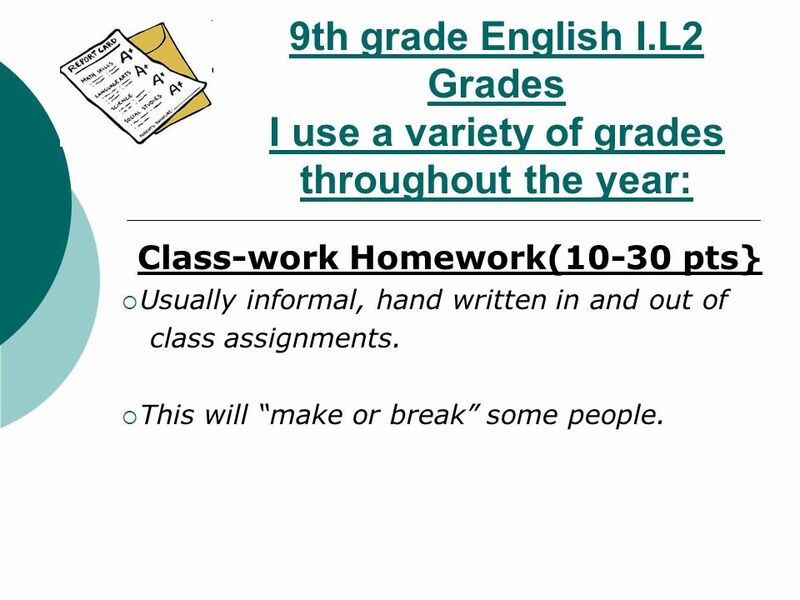 English 9 and 10 Ms. Bains. Daily Class Structure  Bellwork or journal prompt  Discuss bellwork or journal prompt  Begin reading or activity (you may. 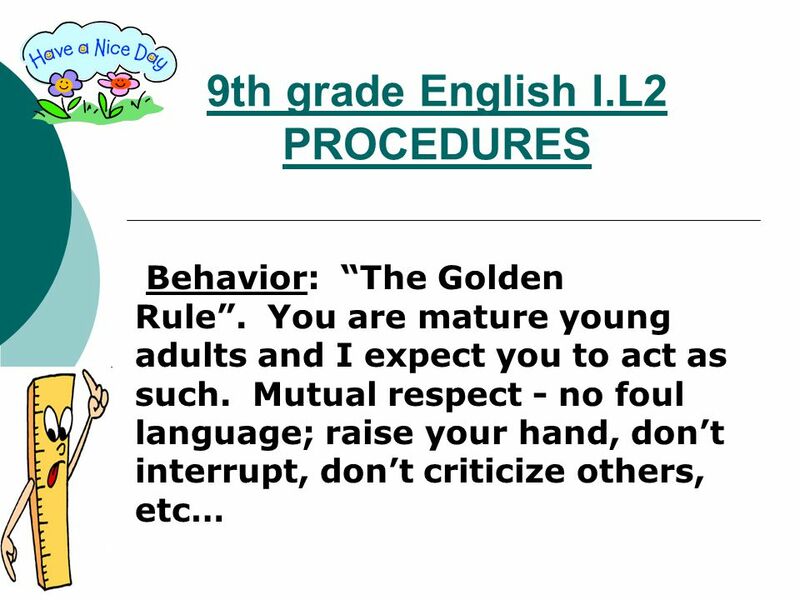 Welcome to English 2DI! HERE’S WHAT YOU NEED TO KNOW! 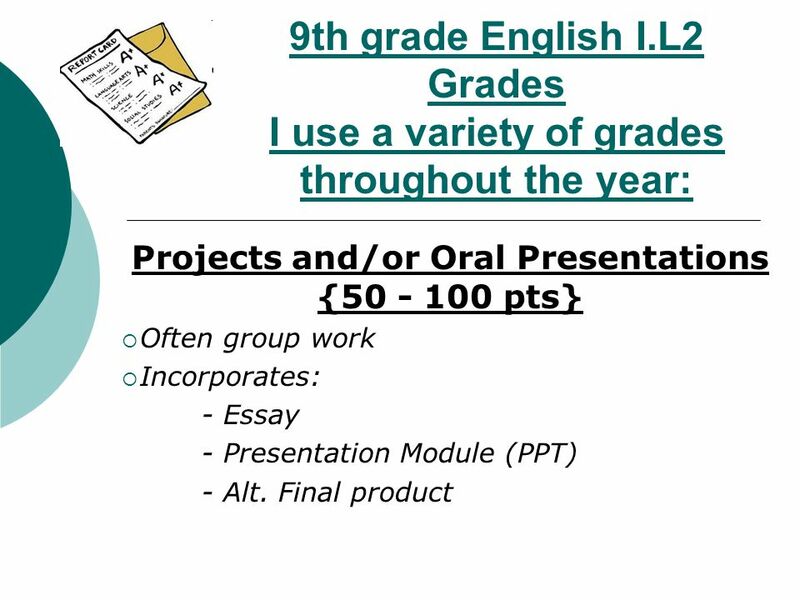 What are the goals of English IV? Creative Writing Expectations Class info This class is going to stretch your imagination! If you don’t like to write (or feel you don’t have. 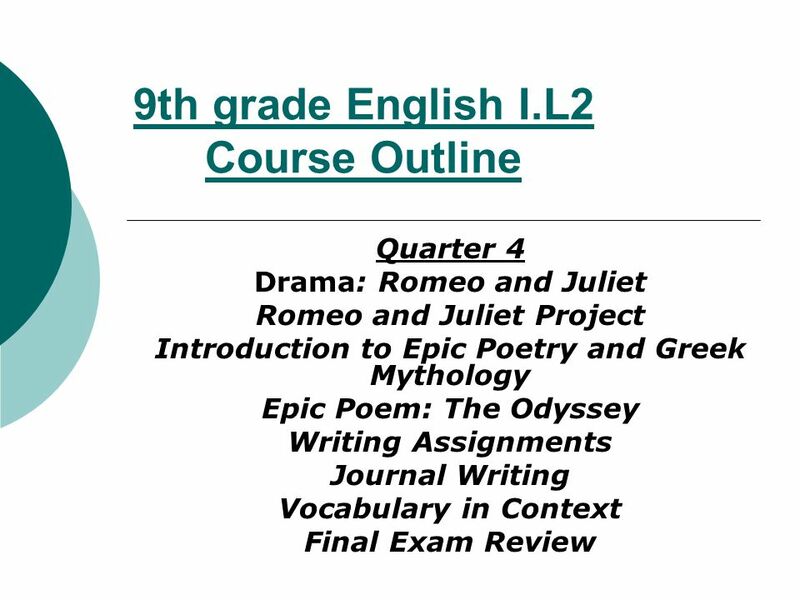 English Language Arts 11 th grade English at ODY. 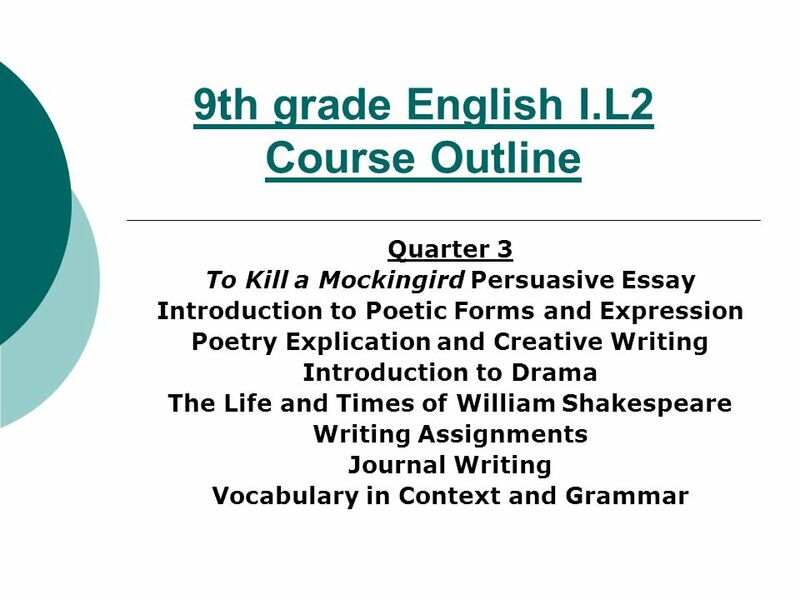 Welcome to Pre-AP/IB English!!!!!!! Ms. Jessica Boyce Information can be found on my website. Don’t forget to sign up for my parent newsletter by ing. Leesburg High School Mrs. Amanda Callender English I & II.